I’m thrilled to announce that I’ll be returning to Europe in the Winter of this year. Shows land in December and will be held in some very unique and special venues. My dear friend Matze Rossi will be onboard and we will both be looking forward to a string of great evenings. These special venues come with a limited capacity so don’t wait too long to grab your tickets. Thank you for the support! 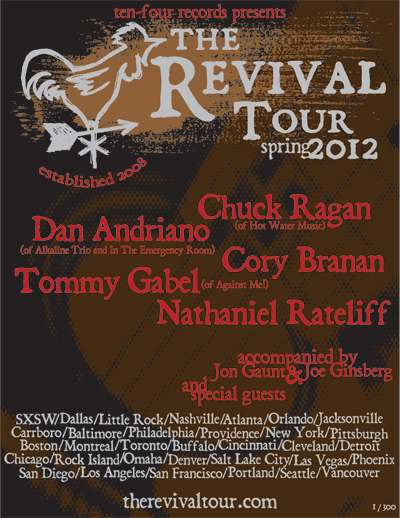 The Revival Tour begins its fifth year this March with a company of amazing storytellers in Chuck Ragan, Dan Andriano (Alkaline Trio, The Emergency Room), and longtime Lucero collaborator Cory Branan, Tommy Gabel (Against Me! ), and renowned singer/songwriter Nathaniel Rateliff. In celebration of this year’s tour, SideOneDummy Records will be releasing a very limited edition die cut 7” on April 3, 2012 in the shape of a saw blade. Featuring two unreleased tracks from Chuck Ragan’s Covering Ground recording sessions (“Field Holler” and “Live By the Sword”), an exclusive red version of the vinyl will only be available with pre-order tickets for The Revival Tour. Visit Tour Dates for a full list of confirmed dates (more to be announced for 4/13 to 4/22 next week), and visit The Revival Tour to learn more about the project. 2011 was a big year. 173 shows, 77,242 miles and it’s all captured on this print. With 2012 showing no signs of slowing down, we made this limited edition piece to commemorate a huge year past, and look forward to another full year ahead. This 2012 calendar is screen printed and hand-numbered by the one and only El Jefe. Printed on 18×24 French paper, every poster is shipped rolled in a poster tube. Only 300 were made. When they’re gone, they’re gone! Get yours tomorrow at 9AM PST for only $15.99 in the Store. Our friend Rey Roldan at Another Reybee Productions has recently undergone a serious house fire. So the kind folks at at Paper + Plastick and various other labels are lending a hand in helping Reybee out, in hopes that you do to. They’ve put together a 40 song compilation album, all for the awesome price of “donation only”. Check out tunes from Samiam, Strung Out, Less Than Jake, Polar Bear club and more. You can make a donation here. A short film that Chuck has done the music for is now complete. Scott Toepfer (who did the photography for Covering Ground) put this project together. It’s Better In The Wind is his labor of love-and now and I’m happy to pass it along to you! Any help spreading the word is most appreciated. At 2pm today, check it out!